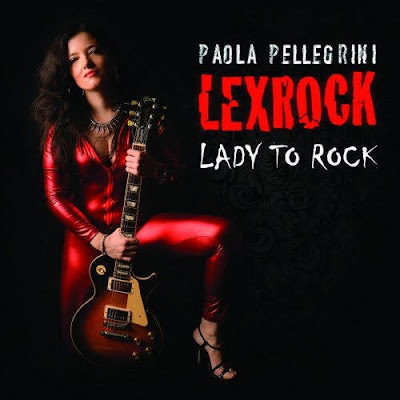 I have already presented to you Paola and her band some time ago through my webzine and I am really glad to see that she remembered me and asked me to present her new album too under the title “Lady to Rock” which I have to say describes perfectly Paola and what she wants to achieve through her music. One thing I admire in Paola is how she manages to combine her work, she is a criminal lawyer with her passion for rock music. You see I am a lawyer too and no matter what you think about us (of course some of the things you think are right) this is a job that has a lot of anxiety, responsibility and doesn’t always pay well, at least here in Greece. So, having this job, is really a big accomplishment to also find time to compose music, write lyrics and produce an album. Yes my friends Paola writes the music and lyrics on her albums. I think you can do that only when you really love something and also because rock music is a way to escape from the grey reality of the law and order world. The music of Paola cannot easily be tagged, because as in her previous album, here too she offers us compositions that have references to the whole specter of rock music. The common ground of all the compositions that are included here are the catchy melodies and the positive energy they deliver to the listener. So, in “Lady to Rock” you will have the chance to listen to songs that range from radio friendly rock to punk and hard rock and of course there are some heavy metal references too like in the song “You Better Believe” which has this IRON MAIDEN like tune as it starts. The whole album is really very good and personally speaking I find it to be a step above her previous release. Some of the songs that stand out based on my preferences are the following: “No Half Way”, “Endless Begin” (this one is maybe my favorite one), “What I Like”, “You Better Believe” and “All my Love is Gone”. Damn this is a good release and deserves your attention. Good job Paola. Αναρτήθηκε από Nick Parastatidis στις 6:32 π.μ.